In the year 2000, the District of Columbia had three miles of bike lanes. Today, the district has roughly 80 miles of bike infrastructure, including the first lanes in historically underserved Ward 8. Many other U.S. cities have made similar investments. Bicycling Magazine’s top 50 bike friendly cities includes some unsurprising places at the top – Minneapolis, Portland, Boulder, Seattle – but also shows how cities such as Cleveland, Miami, and Baltimore have made important strides in the last several years to improve their bike systems. Several of these cities are members of the National Association of City Transportation Officials (NACTO), which has put out its best-selling Urban Bikeway Design Guide, first released in 2011, now with an updated second edition this year. NACTO’s updated second edition is part of their “sustained commitment to making city streets safer for everyone using them.” Reformatted in an attractive hardcover with improved structure, it features photos, diagrams, and 3-D renderings of wide-ranging best practices in design for bike infrastructure. Also new is a chapter on bicycle boulevard planning and design. I particularly liked the handsome, debossed linen of the new hardcover, with its simple design and retro 1970s vibe. Photographs show examples from cities around the country. The diagrams and renderings highlight important design recommendations for those looking to implement these solutions. 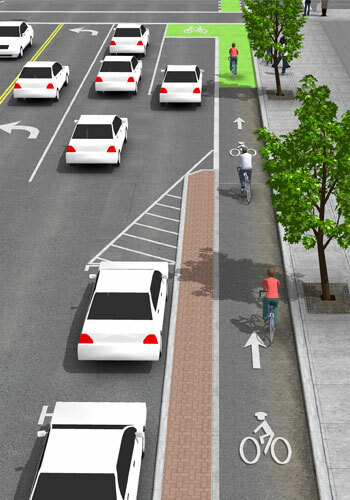 While the standard bike lane many likely think of is included, the design guide offers many alternatives that make biking safer and more efficient for pedestrians and drivers as well as bikers. The buffered bike lane, separated from cars by a few extra feet marked with painted strips. Buffered bike lane (Seattle) / NACTO. 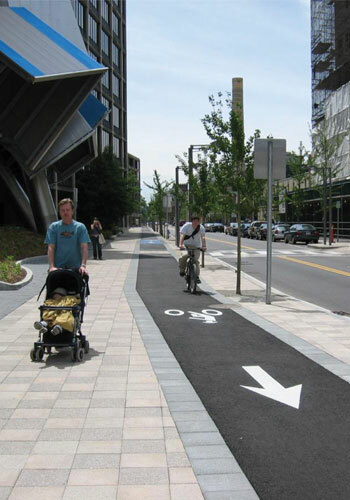 Or the cycle track, a lane nonadjacent to moving cars, which might be protected by parked cars, raised in elevation, or even moved alongside the pedestrian path on the sidewalk. 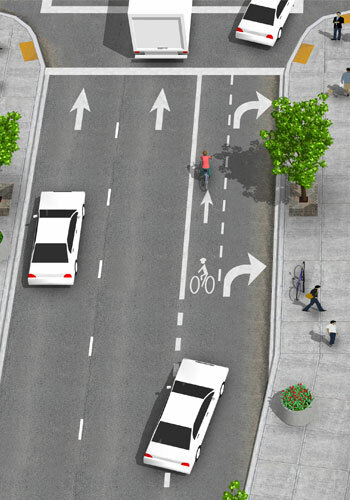 Combined bike turning lanes that help bikers and drivers navigate the mixing zone created when bikes approach an intersection and cars need to make a right turn. 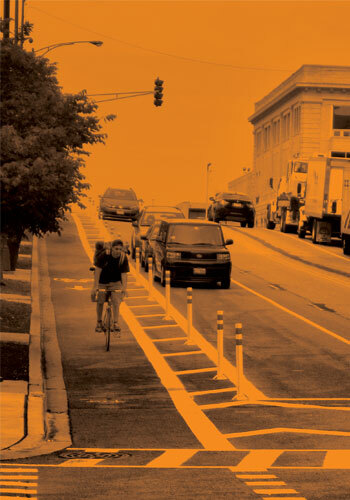 Bike boxes – designated areas at the head of a traffic lane that provides bicyclists with a safe and visible way to get ahead of stopped traffic at a red light. 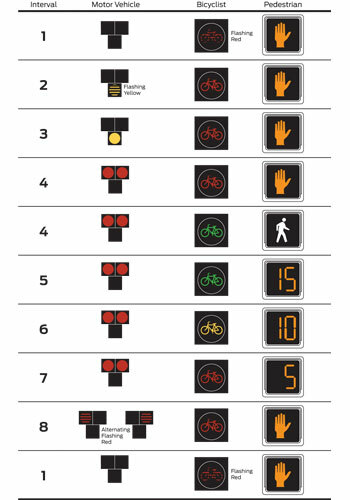 Signal phasing for traffic lights, which help to clarify when bicyclists should enter an intersection, and restrict vehicle movements. As mentioned, the reissue includes a new section on bike boulevards. These are multi-vehicular streets with low traffic and low speeds designed to prioritize bicycle travel. Creating these boulevards begins at the city planning level, analyzing which streets are appropriate and designing networks of boulevards to maximize accessibility. Signs and pavement marking designate the boulevards. Vehicular traffic is slowed through traffic calming measures such as raised crosswalks and intersections, speed humps, and “pinch points” where the street is narrowed through curb extensions or medians. Many of these measures can also easily include green infrastructure, part of the “green” and “complete” streets design standards. Landscape architects, planners, and city officials should find this guide invaluable. Anyone who advocates for increasing bicycle infrastructure in our cities will find many useful tools for implementing best practice infrastructure. Notes and references listed in the back of the guide also offer a good starting point for those looking to get up to date with the literature on biking infrastructure. 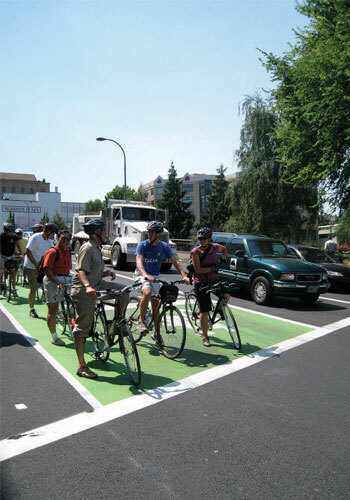 Many of the recommendations can be found on the NACTO website. 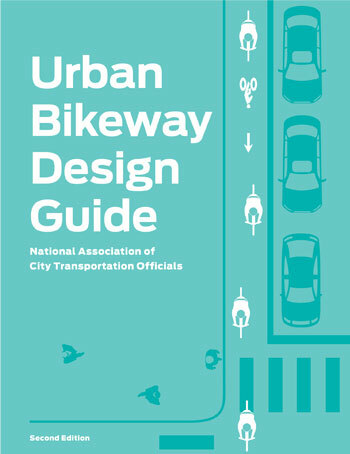 But if you’re someone like me who just likes to geek out on well-made diagrams and renderings, the new and improved Urban Bikeway Design Guide will gladly find a nice home on your bookshelf or coffee table. Segregating cyclists from traffic is entirely the wrong and most unsustainable approach to restoring and increasing cycling as a form of viable transportation in our cities. This type of infrastructure creates deadly conflict points that motorists are not accustomed to looking for cyclists. This type of infrastructure continues to be secondary to the roadways of the motor vehicle, thus insufficient in providing the connections to destinations for cyclists. Increased education on sharing the road and bicycle driving through driving safety classes, public workshops, and middle/high school curriculum would incur a fraction of the costs that this type of wasted infrastructure already burdens society with. The reduction of motor vehicles in our cities. Slower traffic in the city is safe. Planning ahead to adjust commute and delivery times based on slower traffic is what we should be pressuring motorists to do, not expecting taxpayers to support multi-million dollar infrastructure to appease a declining use to gain a few minutes. As long as the bicycle is not viewed as a sub-form of transportation, conflicts and fatalities will continue to increase. I am a bicyclist and I am traffic. Thank you, Matt Boehner. Dead-on commentary. We fight the good fight. I fully agree with you in principle, though transitioning suburbs (they are cities too) is a different game and often come with more complex conditions than simply sharing the road. This includes wider lanes, faster speeds, more truck traffic, more families, more kids (as Joan pointed out), etc. than the city you might imagine to be. If a council were to approve a bicycle master plan and implement it all within a year, I would see no problem with your statement, however most cities aren’t run that way. So while education continues to create more awareness what do you suggest places that aren’t Copenhagen, NYC, or Portland do? As a landscape designer, bicycle commuter, and county BPAC member, I fully agree with Matt Boehner’s comment. Edge behavior, whether mandated by facilities or not, causes turning conflicts and unintentionally invites motor vehicles to pass too closely. The edge is also home to dangers like door zones, poor visibility, gutter seams, and debris. Educated cyclists defend themselves against all of these common crash causes by using the far superior facility: the general purpose traffic lane. 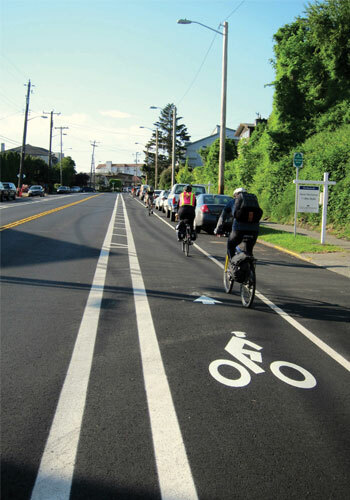 Traffic lanes can accommodate more cyclists, have great sight lines, and already go everywhere. Liberally installing lane-centered sharrows and “Bikes May Use Full Lane” signs, and reducing some speed limits, is much cheaper and uses less land than segregated infrastructure. Having cyclists as a normal and accepted part of traffic in the right hand traffic lane also does wonders for traffic calming. Most importantly, it promotes safe practices rather than unsafe ones. As a cyclist, I understand what the folks above are saying, and agree that we are indeed traffic, and deserve the right to share the road with all other users equally. I like the ideas presented in the comments thus far as well, but there are a couple reasons simple lane markers will not solve the issues with commuting in America. Cyclists get no respect and in fact are often considered second class citizens. Beyond this cultural trend (in America), there is the issue of safety or perceived safety in unprotected bike lanes. Segregating bikes physically from cars in congested areas keeps the texting buffoons from being un-ticketed murderers. They also have an added bonus of creating a condition that will promote more use by new riders, with a renewed sense of safety for themselves and their children. Yes, confidant riders, who understand traffic laws will feel confidant to ride with cars in urban areas, but shouldn’t the goal of new infrastructure be to reduce the cars, and convince more folks to leave the cars home? There are designs for intersections that take the concerns above into account, and I think these guidelines could be enhanced with these refinements. I understand both sides to the “separated infra” argument, especially having ridden in both situations extensively in Germany and the US. I have to say that I had no issues riding on raised cycle tracks on the road in Germany, though traffic in general is likely lower than most places in the US, and motorists are much more accustomed to bikes. Shared lanes and even on-street lanes come with their own problems, of course – double parked cars, dooring, and irate motorists who think you don’t deserve a piece of asphalt to ride on. The best solution is not so clear. Each treatment is probably appropriate in different spots depending on context. Other thoughts? The purpose of protected and segregated bike lanes is to increase bicycle ridership beyond the adept bicycle commuters or potential ones. Younger and older members of the population as well as young adults who didn’t grow up riding bikes as kids (and there are a surprising number of these) would especially benefit from protected lanes. Bring on the education and signs to more seamlessly integrate bicycle commuters with traffic, and bring on the protected lanes on other streets for the population who, for whatever reason, aren’t going to cycle with traffic. Unless there is only one street in each direction in your city, it doesn’t need to be an either-or situation. If you look at countries where they have massive amounts of cyclists (China, Netherlands) there is a lot separation between cars and bikes. If we want to see more people cycling we need dedicated bike only bike lanes. I am a very confident rider, and also drive a car a lot cycling across London . . . terrifying. Another problem with efforts in the UK is how disjointed the infrastructure is, cycle ways stop at the most tricky parts of the road, roundabouts being classic example. For those who think bikes belong on the roads, you obviously haven’t looked at the bicyclist fatality rate in countries that think a little white line will protect bike riders. Even worse, those people who think that bike riders “are traffic” are one word shy of a full sentence. Bike riders are traffic fatalities. The more separation between motor vehicles and bicyclists, the better. A white line isn’t enough. Physical separation is a good start, but a better solution is completely separated bicycle routes. In other words, bike paths such as the Mt. Vernon Trail. For those people who want to risk their lives riding on the roads, far be it from me to stop them. But for those of us who value our lives, we want and deserve completely separated bike routes. BTW, I agree w/ Sunlight Daylight. If we want to encourage cycling, we need dedicated bike lanes and bike paths. If there was such a thing as a bikeway from where I live, I’d love, rather than fear, cycling to work.